If ever a crest was created for the Wray family from Hertfordshire, it would feature a hurdle and billhook. In my family, there are 6 generations of Wray hurdle makers with 16 known exponents of the craft which was passed down from father to son. The surname, Wray, may be a nickname derived from the old English word ‘awry’ which means twisted or crooked. In Yorkshire, a ‘wray’ was a ‘corner, nook or remote place’. For five thousand years, man has used hurdles to pen his livestock and as temporary fencing with which to divide his land. They also protected young lambs from fierce, bitter winds. Hurdles are light, durable and portable – several may be carried on a shoulder. A considerable amount of pliable hazel and willow wood is used to make wattle hurdles – each craftsman may take cuttings from four acres of woodland. In wintertime, hazel trees are prepared by being coppiced (or cut back hard) to promote several new ‘whippy’ shoots from the stump. The direction of the coppicing cut is important as it should be upwardly-facing to allow rainwater to run off. A present-day resident of Tewin reports that even now, the woods show evidence of the coppicing work done by hurdle makers which would probably have included the Wrays. There are surviving low stumps of hazel with several long rods bursting from them, the appearance of which is quite different to trees which grow naturally without interference. Later in the year, the tender, flexible, green shoots are cut, collected and split using the hurdle maker’s stand-by tool – the sharpened billhook. The wood is woven and twisted between vertical poles or zales which are inserted into holes bored out at equal distances in a log or base-board. A six-foot long hurdle would have nine zales which are slightly offset toward the middle. These upright poles act as a template. The ends of the hurdle are then trimmed neatly with the bill. After the hurdle has been assembled, it is stored to allow nature to take its course. The wood will dry, season, toughen and change colour to an attractive deep brown. The offset of the zales is redressed as the hurdle flattens and tightens. A hurdle maker could make at least four hurdles each day. In 1790, a hurdle was worth about 6d. Therefore, six days work could result in an income of about 12/-. The farm labourers’ wage was between 9/- to 10/- at this time. 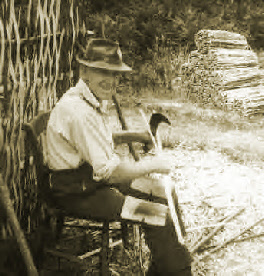 The only cost to the hurdle maker was his time, which included the hours spent coppicing and cutting his raw materials. 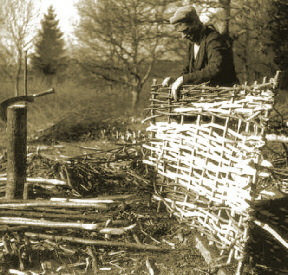 As his work was seasonal, the hurdle-maker might augment his income (as my grandfather did) by laying hedges – the principles of which are similar to hurdle making. Hurdle making skills were passed down from father to son. Their specialized work elevated them above the farm worker. However, their work also meant that some sons had to move from their parents’ home because only a few such craftsmen could find employment within the small rural parishes. As a result, the Wrays were not rooted in one parish but gradually spread to other villages in the surrounding area. The branch of the Wray family that had settled in Preston, Hertfordshire by 1900 can trace its two-hundred-year-old origins to the rural parishes that nestle between Hatfield and Hertford. 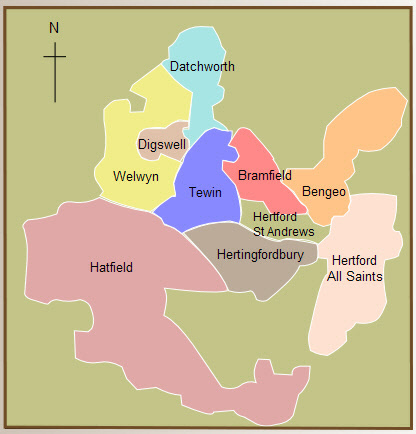 These included Tewin, Bengeo, Digswell, Datchworth and Hertingfordbury. It is likely that my greatx5 grandparents were John Wray and Ann Tingy who were married in Bramfield on 12 October 1715. They had eight children seven of whom were baptized in Bengeo. There are two reasons for thinking that they were my ancestors. Firstly, my Wray forebears can be traced with certainty back almost 300 years to Henry Wray and his wife, Ann. Their first child was baptized in 1747, which would indicate Henry was born in about 1722. John and Ann’s son, Henry, was baptized in 1718. There is no other Henry Wray recorded as being born in Hertfordshire at this time. 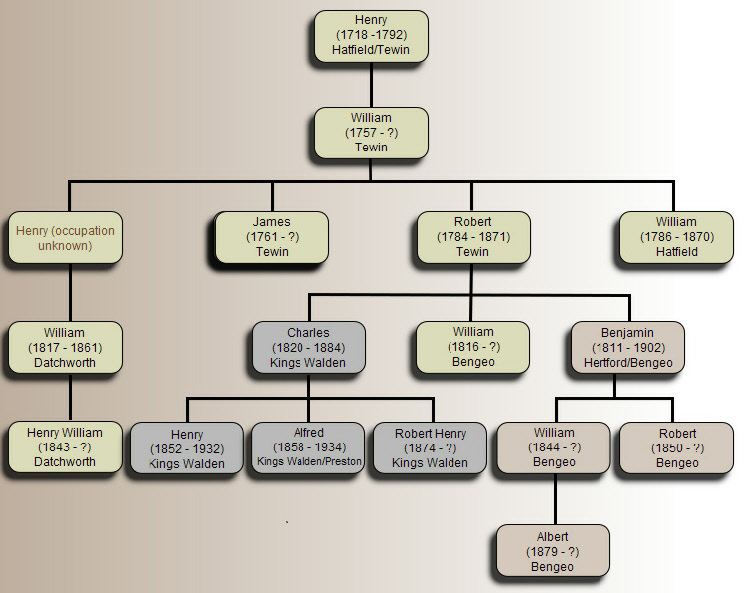 Secondly, of John and Ann’s children, four sons moved to Hatfield - as did my ancestor, Henry. It is with greater confidence that I write that my greatx4 grandparents were Henry and Ann Wray who had at least seven children who were all baptized in Hatfield between 1747 and 1769. It is likely that Henry married Ann Mead at Sawbridgeworth in 1746 as their first child was baptized in the following year, 1747. Again, no other Henry Wray’s were noted as married in Hertfordshire about this time. Henry and Ann Wray m 1746? crossroads of the St Albans to Hertford highway. In the nineteenth century, it was surrounded by ‘luxuriant pasture and corn land’ though the topography was ‘rather hilly’ and was originally forested. 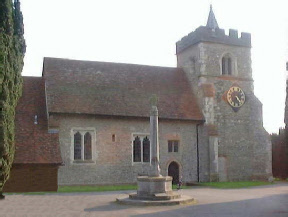 The parish church of Hatfield is St Ethelreda (right). Around 1760, the Wray family was mainly situated in the village of Cromer Hyde which is about three miles north of Hatfield. Information about Henry can be gleaned from the Hertfordshire Militia Lists. From 1759 until 1761, he is recorded in the town of Hatfield and is significantly described as a labourer and carpenter. There are several instances of Wray hurdle makers being noted as carpenters in parish records, so it is probable that Henry was the first known Wray to work at this craft. Henry and Ann then moved a few miles east to Tewin.The first mention of the Wrays at Tewin is in the Militia List of 1762 which records Henry’s presence in the village. He is only mentioned in the List for that year - which confirms that he is the Henry who was in the Hatfield List until 1761. (The Militia Lists in 1762 only included men aged 18–45 and Henry would have been 45 in 1763.) Thus, Henry and Ann Wray moved to Tewin around 1761-62. · Ann, Henry and Ann’s daughter, although baptized in Hatfield, married and lived in Tewin until her death there in 1821. 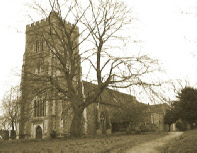 · When William and Mary’s daughter, Anne was buried in Tewin in 1815, she was living in Hatfield. · After William and Mary’s daughter, Sal, was born, she was baptized in Tewin though the parish register notes that William and Mary were living at Hatfield. · William and Mary’s son William was living in Hatfield with his wife, Susan, until his death in 1870. Tewin is an ‘attractive, small, straggling village’ situated 170 feet above sea level. It is about three miles north-west of the county town of Hertford. In 1841, its population was 522. With no less than five Greens – Burnham, Upper, Lower, Archer and Poplar – (which may explain the description of ‘straggling’), Tewin is spread over almost 2,700 acres. It is partly arable land, partly woodland and its geology is of chalk and a little London clay. The village’s name derives from Anglo-Saxon words - Tew (God of war) and in(g) (‘sons of’ or ‘an enclosure or meadow’). So Tewin means either ‘Son of God’ or, more charmingly, ‘God’s meadow’. Henry lived in Tewin until his death in 1782 when he was aged 64. His wife Ann survived for almost thirty more years until her death in the village in 1811 when she was probably at least 90 years old. My line continues through Henry and Ann’s son, William Wray, who was baptized in 1757. That he was living in Tewin may be deduced from the reading of wedding banns in Tewin when he married Mary Ward in 1777 in the neighbouring parish of Hertingfordbury - because William was ‘of this parish’. This brief note confirms that William and Mary were my direct ancestors. William is noted in the Militia List at Tewin from 1778 until 1783 which indicates that the couple settled in Tewin after their marriage. The List records his occupation as ‘lathe render’ (sic) or hurdle maker. William and Mary had seven children baptized in Tewin between 1777 and 1800. When the last child, Sal, was born the parents were of the parish of Hatfield. Mary was buried at Tewin in 1826. William and Mary’s son, Robert Wray (baptized 1784) was my greatx2 grandfather. He was also a hurdle maker. When he was about twenty years old, Robert had a liaison with Sarah Holden. She was a spinster from Little Berkhampstead which is about four miles from Tewin. A son, John, was born and as Robert and Sarah did not marry, Robert was ordered by the local Parish officials to pay maintenance for his child in the summer of 1804. Two years later he married Jane North in Tewin on 23 September 1806. Both Robert and Jane marked rather than signed the register and their witnesses were Elizabeth Wray (probably Robert’s sister) and Henry Cutts (Robert’s cousin). Robert and Jane had nine children between 1807 and 1827. The family were living in Upper Green Tewin in the censuses of 1851 and 1861. The Tithe Map of 1838 and Apportionment shows the location of their home (73b). 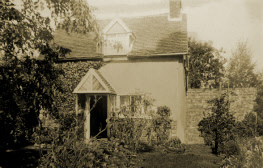 On a summer’s evening in 2006, I began a quest to find the home of the Wray family (recorded as 73b) in the nineteenth century at Upper Green, Tewin. As I had a copy of the detailed Tithe Map and Award dated 1838 which clearly showed the property, roads, ponds and surrounding area, I was confident that I would at least find the land on which the house was built. 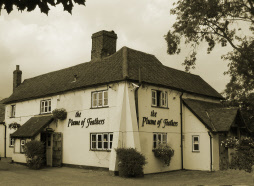 It seemed entirely appropriate and indeed a requirement to begin the search at the ‘Plume and Feathers’ public house (below, left). It was built in about 1600 and because it was situated less than hundred yards from the Wray ancestral home, I had no doubt that my forefathers had slaked their thirst there. The open land (shown as 106b on the map) is now a cricket ground and this space together with the road helped to locate the plot which I was seeking. However, the land is now grandly occupied by a modern detached house. Was I at the right spot? I decided to call at the nearest house (right) which might have stood in the nineteenth century – shown as 73c on the map. Its occupants kindly confirmed that their home had been built in the 1750s and that they knew of an old house next door and a deep pond as depicted by the map. I was at the right place. They told me that during World War II, the garden next door had taken a direct bomb hit and that the cottage had been largely demolished and the new house had been built around some of the surviving walls. It is possible to trace the outline of the bomb crater from the different colour of the grass in-fill. I then called at the detached house. Its occupants made me most welcome and generously told me about their home. They even allowed me to take some photographs of the original walls of the Wray home. 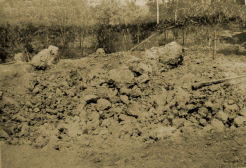 The Wray home at Upper Green, Tewin and the bomb crater - the ‘ancestral pile’? The next day I discovered that Hertfordshire Archives hold a ‘Bomb List’ of known instances of bomb damage. It seems likely that the Wray home was blitzed on 9 October 1940. A local resident later recalled that, as a fourteen-year-old, he had cycled from Stevenage to Tewin the day after the bomb exploded. When he explored the site he found some shrapnel from the casing which was imbedded in the trunk of an apple tree. He salvaged a piece and has used it as a door-stop ever since. Jane Wray died at Tewin in 1859, aged 76. 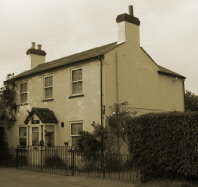 By 1871, her husband, Robert, had moved to the neighbouring parish of Bengeo where his was living with his spinster daughter, Elizabeth, and his married son, Benjamin, at Molewood Road. When Robert died later that year, aged 88, he was living at Hertingforbury. Probably he was staying with his married daughter, Elizabeth Crawley who was living in this parish. Robert’s movements illustrate how the Wrays moved between adjacent parishes. 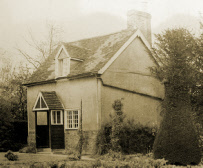 By 1871, there was no Wray living in Tewin although Robert’s grand nephew, James Wray later lived at Upper Green in 1881 – and he was still living there at the turn of the century. The World War I memorial beside Tewin church (see photo of church above) records the death of Frederick Wray (born 1882c) who was the son of Henry and Pamela who lived in nearby Datchworth. (Notes:The study of the Wrays at Tewin is complicated by the family of farm labourer, John and Charlotte Ray and their progeny. As he was born in Bedfordshire no connection can be made between him and the Wrays of Hatfield. My line continues through Robert and Ann’s son, Charles who was my great grandfather. Link: Charles Wray.